It's an attractive idea. No need to adjust clothing choices. No need to change habits. Just dump a gun in a bag and go. It’s not quite that easy. You'll need a purse that can safely and effectively carry and secure a gun, but that also lets you get your gun out of quickly when there’s a need. You’ll also need to know how to use that purse properly. Just like shooting guns in general, there are skills that are unique to every method of carry. There are also some upsides and downsides you should consider before going with purse carry, just as you should critically evaluate any other way of toting your gun. In this video, I show you some of the things you need to know before you stash a gun in a bag and expect to be able to use it for self-defense. You might notice that I have a number of different purses and other products that I’m using throughout the video. Galco Gunleather graciously donated a number of their concealed carry handbags for me to use, knowing that I would be shooting some of them up. I received the Vertx EDC Satchel as a giveaway several years ago, together with some of their Tactigami gear including their adjustable MPH holster. They’re just some of the purpose-made options available that can make purse carry a little more likely to be successful. Stay mindful of where the muzzle of any un-holstered gun is pointed. Protect the gun inside the purse, making sure the trigger guard is fully protected but without making it impossible to draw the gun. With devices like the Galco CarrySafe, you may find it better to find a way to more permanently secure it inside the purse than the provided clip. Consider how you will access the gun and whether you can keep it in a predictable position. Don’t rely on untested strategies like shooting through a purse. Aside from the question of whether or not you will be able to control where your rounds go, the contents of your purse may make this a bad idea. It may be better to get a grip on your gun and allow the purse to be taken away from you rather than fight to retain the purse with the gun in it. For more, check out the work of Kathy Jackson (the Cornered Cat) and Melody Lauer (also known as Limatunes), as well as my own work (Beauty Behind the Blast). Then come back and tell us what you’ve decided about purse carry – is it worth it for you? How will you make it better if it is? I spend my weekends making things go boom. Pistols are my first love, but I spend plenty of time with rifles and I've made friends with my shotgun. I compete in USPSA, 3-Gun, and IDPA and have trained in both defensive/tactical disciplines and competitive shooting. I'm a former USPSA match director, and have been found on the teaching range with a special focus on women's shooting and defensive needs. Look for the purple-and-gray gear to find me on the range! Good video. I don’t usually sit through long YouTube videos, but this was worth the time. Great video Annette!! Nice to see some women’s issues when conceal carrying. Hope you will do more!! This is great! Probably the most useful and practical video I’ve seen on this topic. Well done. Very interesting. Great to see someone bear the cost to destroy leather purses, for our enlightenment. Have to wonder… can you say a reason why the revolver was much less accurate this time? Mark – Likely a matter of familiarity with the gun. I spend less time on revo than I do with the 320 (a platform that I have 35,000+ rounds through plus dry fire). One is not inherently less accurate than the other, but practice – a LOT of it – will make some difference. 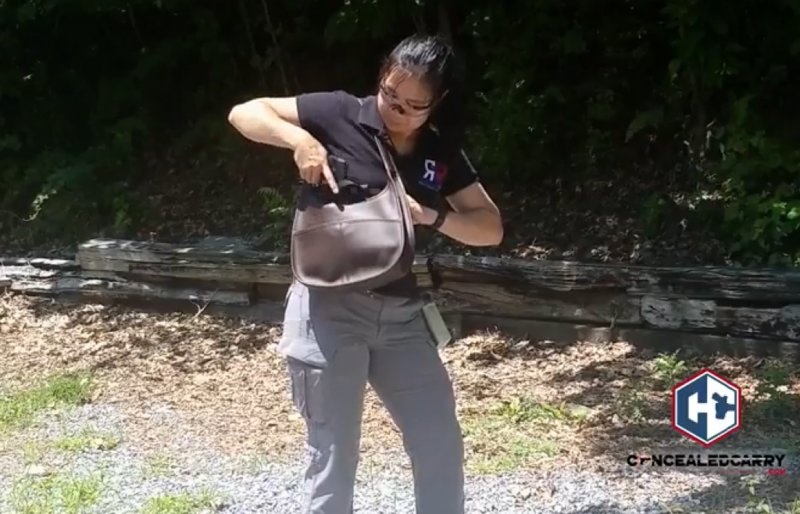 Cheryl – There were two holsters not built into the purses already that I used – the Vertx MPH / Tactigami, and the Galco CarrySafe. Both are linked in the article above. Annette, The video was very informative for me. I make leather goods and l was recently asked to make a purse for a friend that will carry her 38 special. Your video gave us quite a bit to think about for making the purse. Thank you very much for your time. Luisa and Joe. Great video Annette. Very comprehensive and I’m glad you were able to sacrifice the purses for better visuals. Thanks, to the suppliers. I know those purses cost $100+. These tips and considerations should help others who make the decision to or not to carry off body. I’m looking forward to seeing you on Love at First Shot too. Thanks. I hope more men see this information because oftentimes it’s them who suggest it with no knowledge of the practicalities, effectiveness or aftermath of such a carry method. Never been a fan of purse-carry, and I’ll never use it or recommend it. This video demonstrates why perfectly! Thanks for doing such a great job showing the realities, Annette. Very thorough!